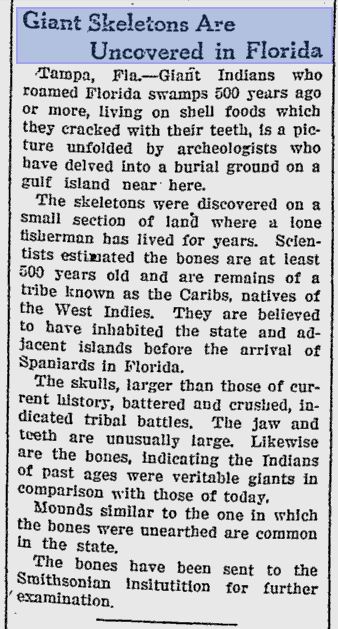 This piece of news was published in The Woodville Republican on August 27, 1927.
ampa, Fla. – Giant Indians who roamed Florida swamps 500 years ago or more, living on shell foods which they cracked with their teeth, is a picture unfolded by archaeologists who have delved into a burial ground on a gulf island near here. The skeletons were discovered on a small section of land where a lone fisherman has lived for years. Scientists estimated the bones are at least 500 years old and are remains of a tribe known as the Caribs, natives of the West Indies. They are believed to have inhabited the state and adjacent islands before the arrival of Spaniards in Florida. The skulls, larger than those of current history, battered and crushed, indicated tribal battles. The jaw and teeth are unusually large, Likewise are the bones, indicating the Indians of past ages were veritable giants in comparison with those of today. Mounds similar to the one in which the bones were unearthed are common in the state. The bones have been sent to the Smithsonian Institution for further examination. Love is all powerful, nothing can defeat It. Posted in GiantsTagged Smithsonian Institution, Florida, Nephilim, Giants, giant mound builders, Ancient America, giant skeleton, TampacommentLeave a Comment on Giant Mound Builder Skeletons Found in Tampa, Florida – Nephilim?